The house can accommodate 4 adults and 2 children up to 12 years old, has been renovated and furnished with great care and passion to offer guests a stay in a charming, welcoming and comfortable environment furnished in a shabby style. Its position, facing the Abbey of San Vittore and towards the picturesque Roman bridge over the Sentino river, make the simple walk in the rooms a unique experience, with History and Nature peeking in front of the windows. The ample equipment of the house includes a complete kitchen with dishwasher, washing machine, fridge with freezer, full size oven, microwave oven, Lavazza coffee pod machine, as well as all the dishes and a complete set of cookware. The two bedrooms are equipped with comfortable double beds of 160x200 and wardrobes with hangers. The living room has a sofa / bed. The two bathrooms, large and well distributed, are equipped with shower stalls, hairdryers and equipment for personal care. A third bathroom is located on the ground floor, in the room available to guests where it is possible to store luggage, even bulky sports equipment such as canoes and kayaks, bicycles and motorcycles. 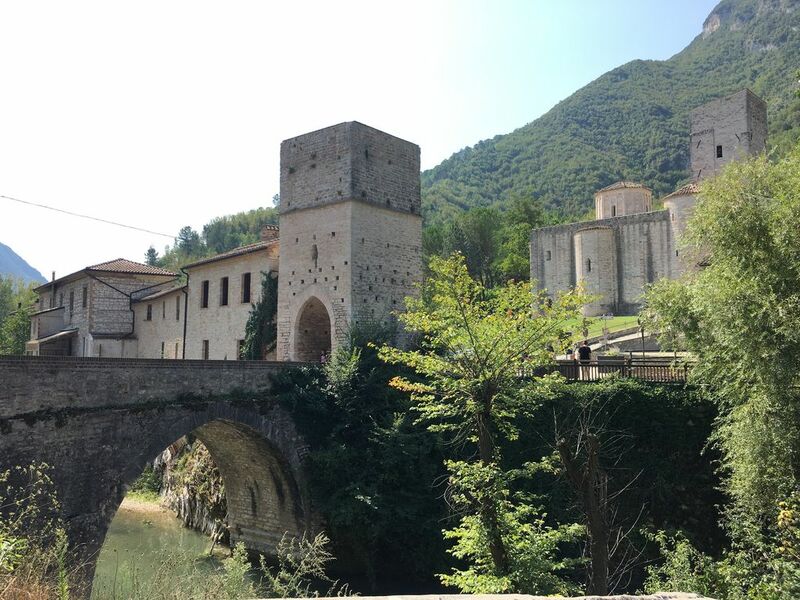 Located in the heart of Italy, on the border between Marche and Umbria, it allows you to easily reach many points of interest such as Fabriano, Assisi, Gubbio and the Conero riviera. A few meters away on foot you can reach the Frasassi Caves (the third hypogeum complex in the world for vastness), the Romanesque Abbey of San Vittore (dating back to the year 1007) and the attached Speleopaleontologico Museum (which houses an exhibit Ichthyosaur fossil), the San Vittore Spa (center of excellence for thermal treatments and beauty treatments based on the characteristic sulphurous water), the Sanctuary of Frasassi with the Octagonal Temple of Valadier set in a cave and the Hermitage of St. Maria Infra Saxa. Numerous sports activities can be practiced on the spot: caving, rock, canoeing and rafting, horseback riding and trekking, with numerous marked trails and routes. The Borgo di San Vittore offers the traveler a surprising high quality food and wine offer with 4 restaurants within a few meters and the characteristic bar / food shop. At the Genga Station 1.5 km (within walking distance) there is a pharmacy, a bank, a mini-market and a hairdresser.